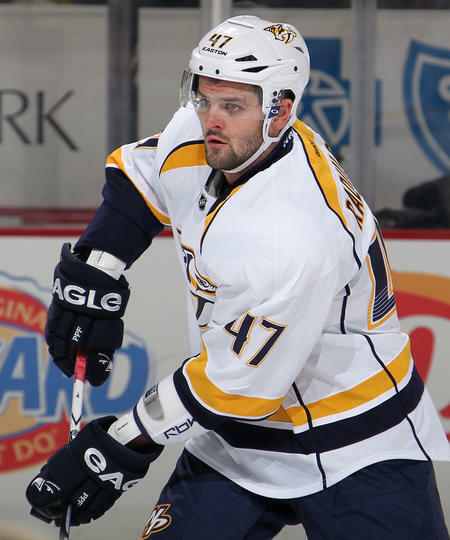 Alexander Radulov wastes no time getting back into a Preds sweater. After a rough and embarrassing loss against the Edmonton Oilers on Tuesday, the Predators took to the road once again, seeking a win in Pittsburgh against the newly-returned Sidney Crosby and the Penguins. Since Crosby’s return last Thursday, the Penguins have left a wake of destruction behind them, burying the Rangers, the Devils, and the Jets. The only team to escape unscathed was the Flyers, and even then it was an OT loss 3-2. Just looking at Pittsburgh’s past schedule (their last loss since Sunday was against Buffalo on February 19th), it is clear the Predators weren’t just going to walk in here and walk out with a win. Even with the return of Alexander Radulov, the Predators were going to have to make little to no mistakes against this Eastern Conference powerhouse in order to steal their ranking back from the Red Wings. Pittsburgh wasted no time letting their fans sing, as Evgeni Malkin sent a speeding slap shot passed Pekka Rinne to seal his 44th goal of the season at 1:23. Malkin is currently 2nd in goals in the league, sitting just a few goals behind Steven Stamkos of the Tampa Bay Lightning. Pascal Dupuis sealed his 22nd goal of the season at 4:06, putting the Penguins up over the Predators early in the 1st 2-0. Pittsburgh would continue to dominate the Predators into the 2nd, with Matt Cooke sending a wrist shot passed Pekka to land his 17th goal of the season at 1:58. Putting the Penguins up 4-0, Chris Kunitz would hit a wrist shot of his own passed Nashville’s goalie to collect his 22nd goal of the season at 7:35. Nashville would finally sink a goal passed Marc-Andre Fleury at 12:01 from Alexander Radulov. Good start since leaving the Predators and NHL four years ago, it was clear that Pittsburgh fans did not approve of Radulov’s return. Hall Gill (11th assist) and Patric Hornqvist (14th assist) picked up the assists on the newly-returned Russian’s goal. Evgeni Malkin would remind Pittsburgh fans who the better of the two Russians were with his second goal of the night at 19:04, sending the Penguins up 5-1. Although his 45th goal of the season, Malkin still falls behind Stamkos in the standings. However, he did surpass Steven Stamkos in points. Many believe Malkin will be top contender for the Hart Memorial Trophy this year. The Predators took plenty of shots on goal tonight, but their accuracy lacked the intensity that the Penguins were able to bestow upon Nashville defense and net. Nashville out-shot Pittsburgh 30 to 23, but again, accuracy was just not in the cards with the Predators tonight. Sergei Kostitsyn, Martin Erat, and Mike Fisher had prime goal chances, but the connection just wasn’t there. Alexander Radulov and Craig Smith also had some close goals, but in the end, it just wasn’t meant to be for the Predators. Although having a rough night, Pekka Rinne was not pulled and replaced with Anders Lindback. As you recall, Pekka was pulled at the beginning of the 2nd Period on Tuesday night against Edmonton due to a chippy performance. Trotz let Peks play the 60 minutes, which may have actually been the best for him. Instead of being frustrated and discouraged from being pulled, a loss at which he had control of may cause him to snap back into his former self. Unfortunately, goalie Marc-Andre Fleury has now surpassed Pekka as leader in wins… just by one point, though. Pekka still has a chance to overthrow the French-Canadian. The Predators only gave the Penguins one penalty throughout the entire game with an interference call on Shea Weber at 19:01 in the 1st Period. The Predators were given two chances, but were unable to perform on either power play. Most would say, “Oh well, at least the loss was to an Eastern Conference team.” However, with the playoffs inching closer by the minute and with teams like the Red Wings surpassing the Predators and Chicago on their coattails, the Predators have no room to be lazy and sluggish. Keep in mind, though, every team goes through rough patches and, unfortunately, the Predators happen to be bopping through theirs close to the playoffs. It’s easy to get discouraged and flustered about the Predators and their future in the playoffs (again, lackluster plays = couch time), but rough patches will and do happen. Last but not least, congrats to Alexander Radulov and sealing his first goal of his NHL career since leaving for the KHL four years ago. Not only that, sinking that said goal in his first game back. Similar to Andrei Kostitsyn’s first goal as a Predator during his first game (also on the road), Radulov started off on the right foot tonight. The Predators are on their way back to Nashville tonight, taking tomorrow off and then taking on another Eastern Conference foe, the Atlanta Thrash- err, Winnipeg Jets. And, just for good measure, the puck will drop at 6PM instead of the usual 7PM start time, easing the folks on EST (what about us with Pacific time?!). Don’t forget, the Predators will be having a public practice tomorrow at 11AM at Centennial Sportsplex.